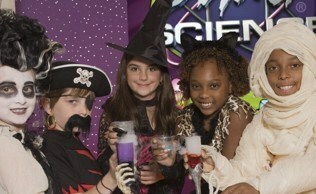 Why Choose Mad Science St. Louis for your Halloween Party Needs? Dove Pan - YIKES! 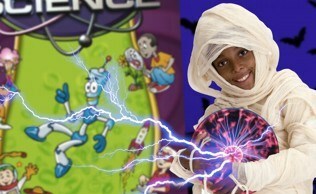 Our Mad Scientist is afraid of spiders. Can he use the powers of magic to make a spider disappear? Count Eggbert - Poor Count Eggbert can't get in his coffin. We will use an invisible force to get him back where he belongs. Countess Meggbert's Apartment - All those styrofoam spiders can be quite annoying! We need to use science to clean up! Melting Witch - Watch in amazement as a mysterious clear liquid melts a witch away! Flash Paper - Watch it go up in flames and disappear like magic! Hovering Eyeball - Beware! The floating eyeball is watching you. Flying Witch (Special Event Shows Only) - Can your Mad Scientist fly on a broom? Well, maybe with a little help from science! Cemetery Effect - It's pretty crreeeepy! Slime Time! - (Parties Only) Whip out your cauldron and mix up a batch of Ooey Gooey Slime. Yuck!